As a leader in your business or organization, it’s your job to identify the roadblocks to success and then blow them up. But how adept are you at recognizing internal problems within your leadership team, or even within yourself? Let’s explore three potential issues that should raise a “red flag” in your team. Confusion. Chaos. Obscurity. Do these sound like things that will lead you to success? These are the outcomes you risk when there’s more than one person accountable for a specific function in your business. For clarity, remember that accountability and responsibility are two different functions within a business. Responsibility can be shared with a team and tends to be more task oriented. Accountability is specific to a leader and includes the yes/no/veto authority. Let’s use a newspaper office as an example. You may have multiple reporters who work under a particular beat or department. These people are responsible for conducting interviews, writing stories, and then submitting them for publication. However, the editor is ultimately accountable for what goes to print. Using this example, can you see how having more than one person accountable for a function can be problematic and sow confusion? What happens when the two accountable leaders disagree or fail to communicate with one another before giving the thumbs up/thumbs down to the responsible party? Whatever the function may be, you only need one person accountable for it. Any more than that is a red flag signaling future trouble. Often times, people ascend to leadership positions because of their skills and experience. They know what needs to be done and how to get it done, having performed many of the functions along the way. While this is a positive scenario, it can also be a stumbling block for some leaders. When left unchecked, it can result in a leader wearing too many hats and taking on too much responsibility when they should be more focused on accountability for their leadership team. Your job as the leader is to monitor and maintain. When you wear too many hats, you stretch yourself thin and abdicate your duties as the leader. Too many hats is not a badge of honor, it’s a red flag. We tend to cling to the things we’re great at – whether it’s sales, strategy, finance, talent development, or something else. While natural, leaders often make the mistake of holding on too tightly to those strengths at the expense of the company. There are a couple of ways this can happen. On one hand, your adherence to your personal strength can cloud or limit the company’s vision – especially when that strength is overused. You risk losing your focus on the big picture because you’re too focused on a specific area where you excel. At the same time, you also risk demotivating and devaluing your employees. Remember, as a leader, your job is to teach and lead people to make their own decisions, to think for themselves, and to grow stronger on their own. If you spend too much focused on your particular strength, you’ll likely end up micromanaging your employees, taking away their ability to grow, and giving them the impression that you don’t trust them. Furthermore, you risk falling into Red Flag 2 above. (Another hat-tip to Kevin Lawrence for this helpful post on helping your team grow in independence). Your strengths are good, and you should utilize them. But as a leader, you must practice self-awareness and recognize when those strengths start to become weaknesses. 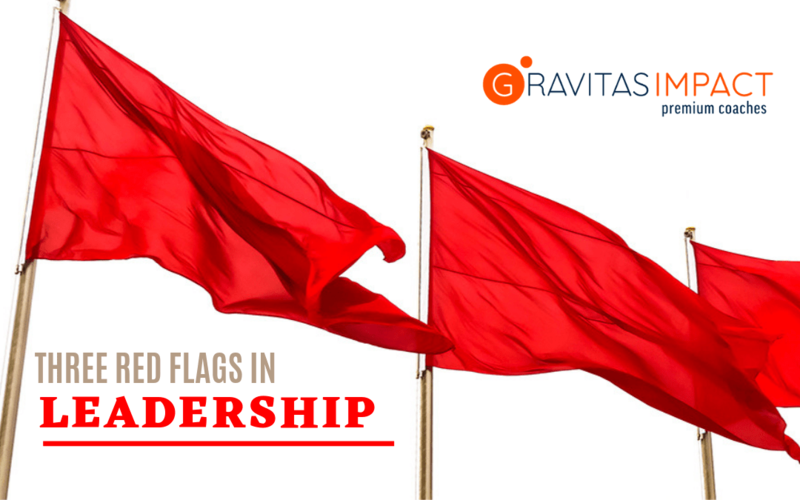 Do you see any of these red flags popping up in your leadership team? Don’t forget to register for our upcoming Premium Leadership Event in Vancouver, B.C.! Get valuable, actionable insights from great business leaders and coaches like Jack Stack, Hazel Jackson, Kevin Lawrence, and more!